I’ve been on somewhat of an arak kick lately. See, I don’t really like arak — I can’t drink it straight, and I despise licorice. But it turns out that I quite like this anise-flavored liquor as a seasoning. Kind of like vanilla extract. I don’t think I’d like to drink vanilla extract straight up, either. Arak is a local beverage with a storied history, having been made in this region for thousands of years. It’s a close relative of ouzo and pastis. At the base is alcohol made from grapes, fermented until there’s no sugar left, soaked in anise seeds and then filtered. Israel’s most well-known brand is Elit Haarak, made by the Gold family’s Galilee Winery, which first opened shop seven generations ago, in Safed in 1824. A classic, but — what can we do? — not a drink that always had the best reputation. 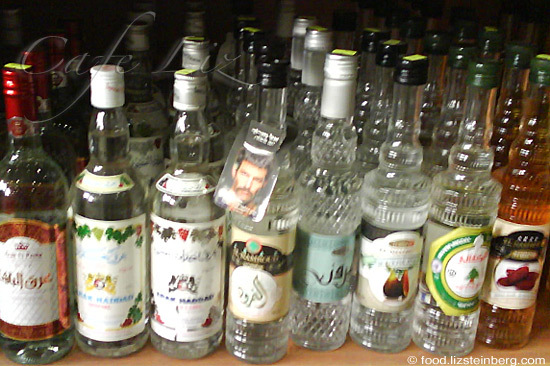 For decades arak was considered a lower-class drink. Elit Haarak was priced at 10 to 15 shekels a bottle as recently as five years ago, and its simply designed, decades-old label didn’t do much to advance its reputation. But all that began to change over the past decade. I found articles from as early as 2003 stating that arak was back in fashion, though I think they might have jumped the gun — maybe more young people were drinking it, but it wasn’t exactly considered a classic drink. I found similar articles from last year, which seem a bit more on target. Nowadays, arak is more than accepted — it’s the liquor of choice in all sorts of mixed drinks in modern Israeli restaurants, and my neighborhood liquor store has different bottles of arak out for tastings. They sell for 45 to 55 shekels — well more than 15, but still less than most other liquors. Not that price is everything, but when it comes to alcohol, it certainly is a major part of cachet. 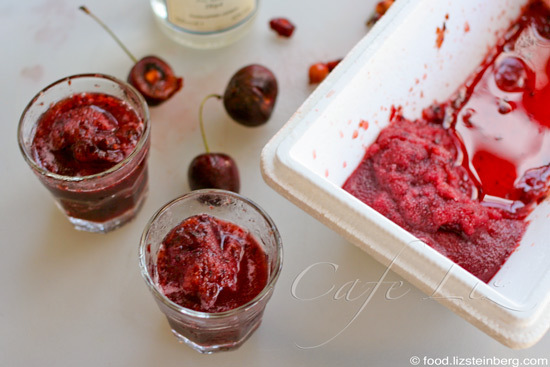 And now, on to the sorbet: It turns out that arak and cherries are a combination made in heaven. Sadly, the cherry season ended right as I was playing with this recipe. So you (or I) can either use frozen cherries, or stone fruit — plums or peaches, among others. The taste will be different, but it’s still good. The high sugar content keeps the sorbet from getting hard, to the extent that if you don’t have an ice cream maker, you probably could just put the liquid straight into the freezer and it would still be soft enough to stir and fluff. 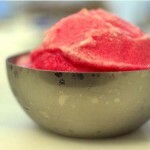 Here’s a nice explanation about sugar in sorbet, plus another arak sorbet recipe. Also, I’ve been making smaller quantities of ice cream than in the past, since we haven’t been finishing full one-liter batches. Prep time: 10 minutes. Total time: 2-3 hours, depending on your freezer. Make a simple sugar out of the water and the sugar well in advance — heat the water and sugar in a pot, stirring until the sugar dissolves. Remove from the flame, cool and refrigerate. Meanwhile, pit the cherries or stone fruit. Once the syrup is cold, use a blender to mix it with the fruit and arak. The fruit should be liquefied. 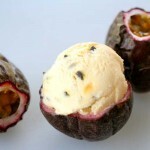 Pour the fruit syrup into your ice cream maker and freeze according to the instructions, for about 20 minutes. Put finished sorbet into the freezer to harden. 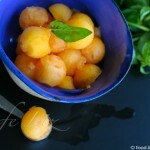 3 Responses to "Sorbet with arak and cherries (or stone fruit)"
I think Arak is Iranian-Armanian iqour. Hi Armin, thanks for your comment. Based on what I read on Wikipedia, the arak that people drink in Iran and Armenia is actually a different liquor than the one we have here — ours tastes like anise, while the one in Iran/Armenia is similar to vodka. Is that the one you’re thinking of?